Sorry about last night’s silence. I was tired and had a headache so I just went to bed instead of staying up past midnight to blog! I have a few more words to say about Sunday’s excursion to the Austin’s 50th anniversary bash. First of all, it was so much fun to go to an event and see so many people we knew back in the day, and have it not be a funeral! I got a chance to talk to one of my old professors, a neighbor whom I rarely see, and a dear lady who worked for the university for many years. It was great to see everyone. Secondly, I wanted to say that one of the things I love about the Austins is their complete lack of pretension. When Dr. Austin was president of the university, Walter worked, as he does now, for the Facilities Services department. That very first summer, back in 1986, the Austin’s son actually worked for Walter on the grounds crew. At the end of the summer, the Austins invited the whole crew to their house for a pool party and barbeque. Walter and I were there with 2-month old Lina. After the excellent meal, everyone crowded into the den to watch a movie, and of course that is when my baby started crying and would not stop! As I moved to take her outdoors where she wouldn’t bother everyone, Dr. Austin stopped me and took the baby. “I need practice for grandchildren,” he told me. “You stay and watch the movie.” For the next hour at least, he patiently walked up and down with Lina on his shoulder. Shortly after that summer, Dr. Austin hired Walter to take care of his yard and landscaping, which is what my husband still does most every Saturday throughout the year. 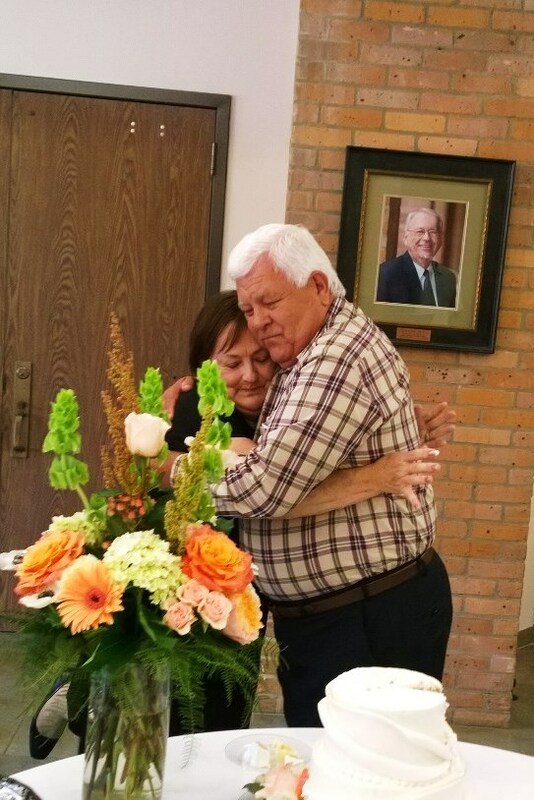 They have a friendship that spans decades now, and I think it speaks to what kind of men both Dr. Austin and my husband are, that the Austin’s grown kids would make a point of inviting the lawn care guy to their parents’ anniversary celebration. We feel privileged to know them. Yesterday was the first day of teaching my two-week essay class. I only have three students, three sweet young ladies that I look forward to working with. The first class is the hardest for both me and them as I throw so much information at them because it’s all stuff they’ll need for the rest of the class! After that, I had a brief break before heading out to a nearby town to meet up with my friend Sybil for a late lunch. I have not seen her since August! I sure do miss the days when we got together every month, but that is just not possible with the busy schedules we have now. After our lunch, we went to a frozen yogurt place and continued our visit until after 5:30. We really need to get together more! As I left to drive home, the heavens opened and I found myself driving in a torrential downpour. What made it weird was that during the split seconds when I could actually see out my windscreen, there were blue skies and fluffy white clouds visible ahead. About the time I made it to the interstate, I had outrun the rain and I could see the city of Kilgore in my rearview mirror, still completely shrouded in rain. I drove the rest of the way on dry roads. I know I have featured this hymn more than once in the past, but that is because sometimes I ask someone else to choose the hymn, and this one is a favorite with quite a few people. Today my husband and I were honored to attend the 50th anniversary party of Alvin “Bud” Austin and his wife Sammie. Dr. Austin was the president of the university for at least twenty years. He and his wife have been so kind and gracious to our family since they arrived in town twenty-nine years ago. I asked Sammie if she had a favorite hymn for me to feature on my blog today, and this is what she chose. Thy love in my heart, Thy light in my soul. King of the seven heavens, may they never depart. This morning I had to get up a little earlier than normal so I could rush up to Walmart in the POURING rain and go shopping and then rush home in time to unload and then leave to pick up Jasper. While I was going through Walmart, the stockers were busy stocking shelves, as they often are at that hour on a Saturday morning. One of them looked up and saw me and did a double take. “Where’s your son? Why isn’t he with you?” I always get comments when I go without Jasper! I ended up not having to get Jasper quite as early as planned, since the whole reason I was getting him early was so he could work with Walter, and there is no working in the rain! Jasper was one tired boy, having stayed up till 4:30 this morning. He took a nap so that he’d be a little more rested when the rain stopped. I hear that the shield was a hit with the birthday boy. I had a lot of prep work to do on my computer, since I start teaching another two-week class on Monday. Every time I teach a class I’ve already taught before, I try to make it better. I also got some revising done and some grading. Walter and Jasper left mid-afternoon to go do their yard jobs, since the rain had stopped. Spencer was gone all day at a water park celebrating Kat’s birthday with her and her twin sister and some other friends. Lucy and I went on an excursion to get a couple of needed items. One of the items was a new hose. The dogs have destroyed our old hoses. No more keeping them in the back yard! This evening I did more grading and prep work, and practiced and tuned my autoharp in readiness for church tomorrow. I also helped Lucy a little with her hair. I’m tired now . . .
Today the primary thing on the agenda was making sure that Jasper got his gift made for his friend Isaac. He had an idea for a gift, and it required some help from both me and Walter. Isaac’s birthday party started this afternoon, so it was a pretty tight deadline. 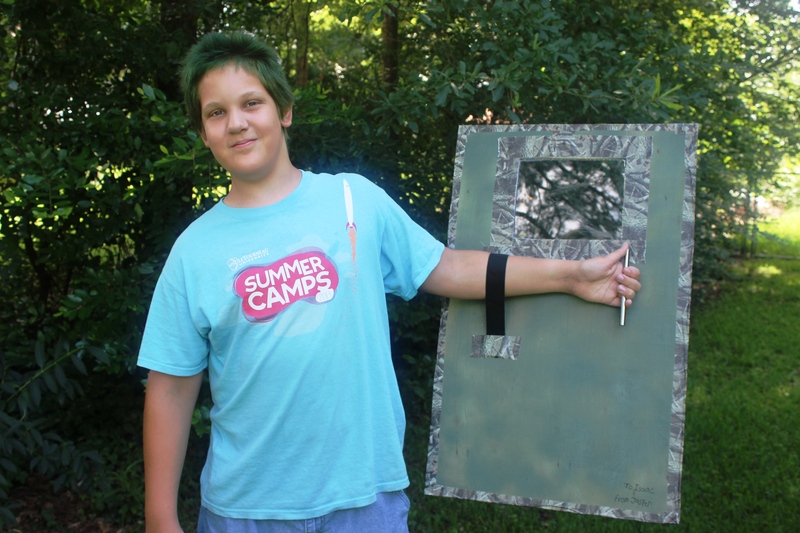 What Jasper wanted to make was a shield for use in airsoft battles. Walter had a thin piece of plywood that was about the right size. Jasper wanted there to be a clear window in the shield so that his friend could see through it without exposing his face. I had a piece of clear acrylic that would work. We got paint and duct tape and a handle for the inside. So, this morning Jasper was doing coats of spray paint. At lunchtime Walter was able to screw in the handle, after I had to make an emergency Walmart run for glue. 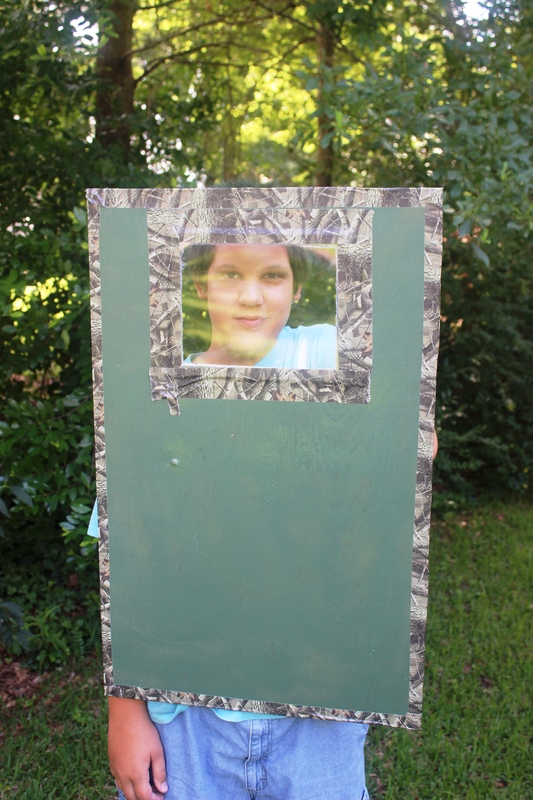 We glued on the window, and then Jasper added duct tape. The final touch was the webbing loop on the back side for putting your arm through. We got done just in time and set off for the party. It was a long hot drive, but we actually got there a bit early, which gave Jasper a little extra time with his friend. He doesn’t get to see Isaac very often anymore, and he really misses him. Meanwhile, after I returned home, our friend Gus finally showed up to check on our beehive. I felt bad that Jasper wasn’t here, but relieved to find out that, as I suspected, our hive seems to be doing okay again. We think there is a new queen and the activity around the hive seems pretty normal. Whew! Lucy and I have had a girls’ night in since Jasper is at a sleepover and Spencer is who knows where and Walter is laying wax for a floor contract. Oh, and Flynn’s interview seemed to go okay. He doesn’t know yet if there will be a follow-up interview. Jasper and I were up at the crack of dawn this morning and soon on our way to the blueberry farm. We went once last year, but it was at the tail end of the season and we didn’t get many berries. We also didn’t know that you really need to go early. Today, we got there very close to the opening time of 7:00, after a drive of 45 minutes or so. Even so, the tiny parking lot was full, leaving no choice but to park in a luxuriant poison ivy patch. Fortunately, I have never had a reaction to poison ivy. It was actually quite pleasant when we started picking. We had a whole row to ourselves and the bushes were covered with berries. I had originally intended to pick for an hour, but we ended up picking for almost two hours and got nine and a half pounds of berries. By the time we finished, the sun was much higher and we were both hot and sweaty. We drove home triumphant and had a late breakfast. 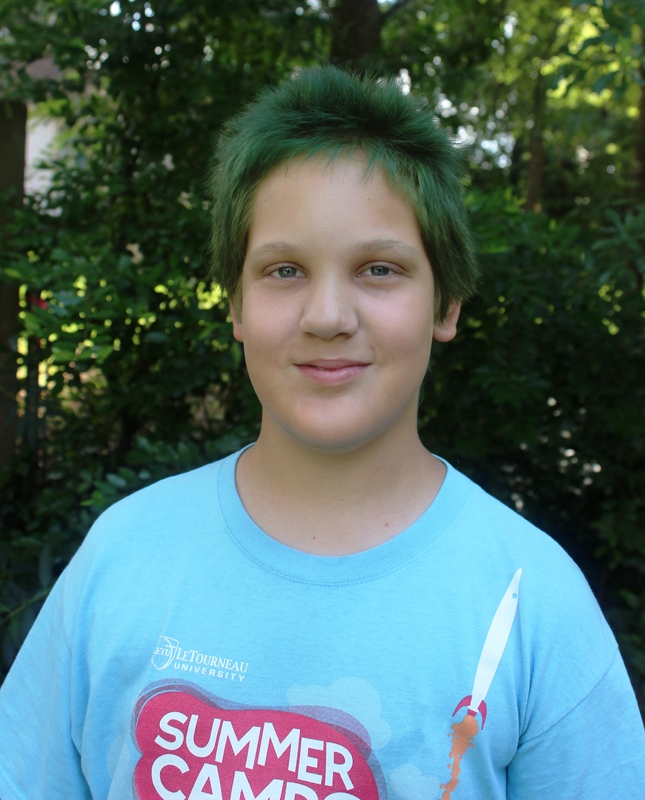 After lunch, I went to my room to rest and when I came out, Lucy had dyed Jasper’s hair green with some “leftover” green dye she had and they were both giggling. I am puzzled. What was the dye left over from? Anyway, Jasper will soon be getting a haircut so most of the green will go away! Jasper had a project to work on, and he needed me to take him shopping, so got that taken care of and it wasn’t until much too late that Walter reminded me there was a beekeeping meeting we had planned to go to tonight. Grrrr! I hope someone we know went so we can find out what happened. We really should have been there. I also got some editing done and figured out what I’ll be playing this Sunday. I haven’t played my autoharp nearly enough this week. 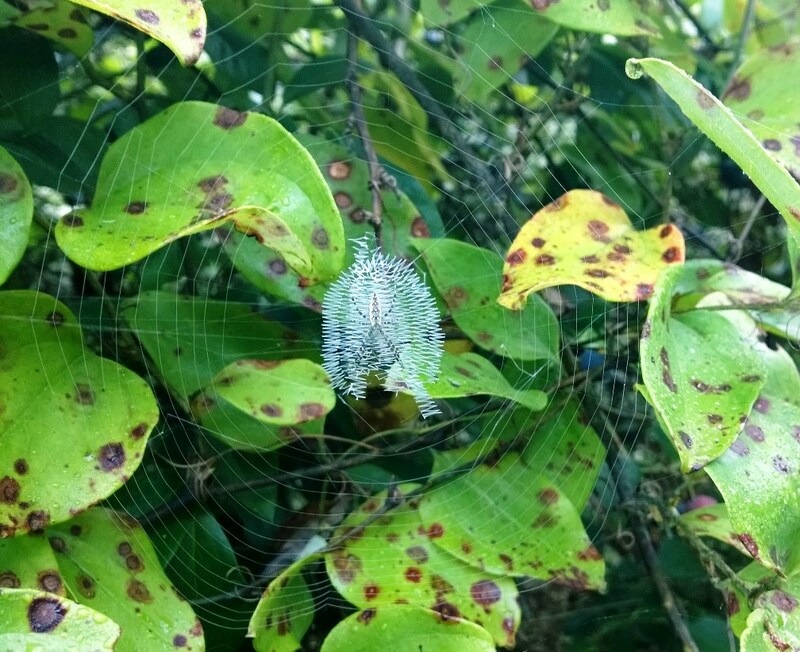 Jasper noticed this spectacular spider web on one of the blueberry bushes. If you click on it you can get a better look and see the proprietor waiting in the middle. Today was Wednesday. It was also my birthday. Unlike this day last year, it was not a very celebratory day, but this year I’m a lot more grateful just to be alive. We plan to celebrate sometime after Walter’s “busy time” is over. I slept in a little this morning and made myself a nice breakfast, which I ate while perusing all the lovely birthday greetings on Facebook. After last night’s critique group, I had some serious revising to do, so I spent some time working on that. It felt good! It seems like I spent most of the afternoon on the phone. Flynn called, and we had a nice chat. He has a phone interview on Friday, and I’m sure would appreciate your prayers for a positive outcome. After I finished talking to Flynn, Lina called from Zambia and we had a jolly old chin-wag that went on for some time. While I was talking on the phone, Lucy made me some birthday falafel. So yummy, and they didn’t raise my blood sugar as much as I had feared! I had promised Lucy and Jasper that I’d take them out for a drink, so even though it was pretty late by the time I got off the phone with Lina, we went out to the car and guess what? The car wouldn’t start. Walter was home by then, so he looked at the car while I came inside and made smoothies for the kids so they would still get a cold drink. By the time I had the smoothies made, the car was fixed! We weren’t going to let the drinks go to waste, though, so we stayed home. Then I got a phone call from my lifelong friend Gwen. She sang to me, and it was good to get a chance to chat with her. Her husband is flying to Zambia tomorrow and had offered to take some things to Lina for us. After supper, my brother Matt called, and I was glad to hear his voice. Walter finally got home from his second job bearing some lovely birthday flowers for me. We finished the evening by watching a movie and there was one final phone call from my mom. It was good to be reminded that there are so many people who care about me. First of all, for anyone who’s been holding his or her breath, Mercy did make it all the way to Yanji after a grueling and rather stressful journey. Fortunately she has a few days to recover before she has to start teaching! She sent a lovely long email will the details of her trip and it was so good to hear from her. My primary job of the day was to prepare for and teach my Story Quest class. Today was the day the kids got to create the character they’ll be writing about for the next five weeks. Some enjoyed it more than others! After the class, I had a few minutes to gulp down some supper before heading out to my critique group and writers’ meeting. A new lady joined our critique group today, someone I already know, so it was good to have her in the group. This group is so helpful to me. I am becoming a better and better writer thanks to them. I know you are wondering what chain of events I referred to in the title of today’s entry. Well, it has to do with my health. I thought this roller coaster I’m on right now was set in motion by my appendicitis, but I have recently come to believe that the chain started sooner. The other day, I was taking a photo, and now every time I use my camera I find myself feeling thankful that it survived my fall at the Renaissance Faire in April. It struck me that my fall must have occurred not long before my emergency surgery, so I looked it up, and sure enough the fall happened less than a week before I became very ill with appendicitis. Furthermore, as I recalled the fall, I thought about how I fell. I fell headlong on my face, slamming hard into the ground. My camera survived, despite the fact that I fell right on top of it, because the ground was very soft and spongy and so am I. Interestingly enough, the part of my body that hit the camera was the lower right side of my abdomen. Intrigued, I did some research to see if appendicitis could be triggered by a blow to the abdomen, and guess what? It’s pretty rare, but there are some documented cases of this happening. All of a sudden it made sense to me why I was asked at several points before and after surgery if I had recently fallen. Each time I said yes, but that I had not been seriously injured. Apparently I was wrong. I was certainly very shook up after the fall and took almost an hour to recover enough to walk to the car. On the one hand, I can’t help thinking, it would have been SO MUCH cheaper to just replace the camera! On the other hand, I have to see the fall as a blessing even if it was very well disguised. If I hadn’t fallen, I wouldn’t have got appendicitis. If I hadn’t been in excruciating pain from appendicitis, I would never have been willing to go to the emergency room. If I hadn’t gone to the emergency room, my diabetes and high blood pressure would have gone un-diagnosed, and I could have dropped dead from a stroke at any time. So, in a way, that fall probably saved my life. Funny old thing, life–right? I had so much admiration and respect for Mrs. Bwanausi (I usually just called her Mrs. Bwana for short). She was always gracious and kind. She made me feel so welcome when I stayed with their family as a teenager. Fifteen years ago, when I had the chance to visit Zambia for a school reunion, I made sure to go visit her. She served me tea and insisted on giving me a gift. What a sweet lady. 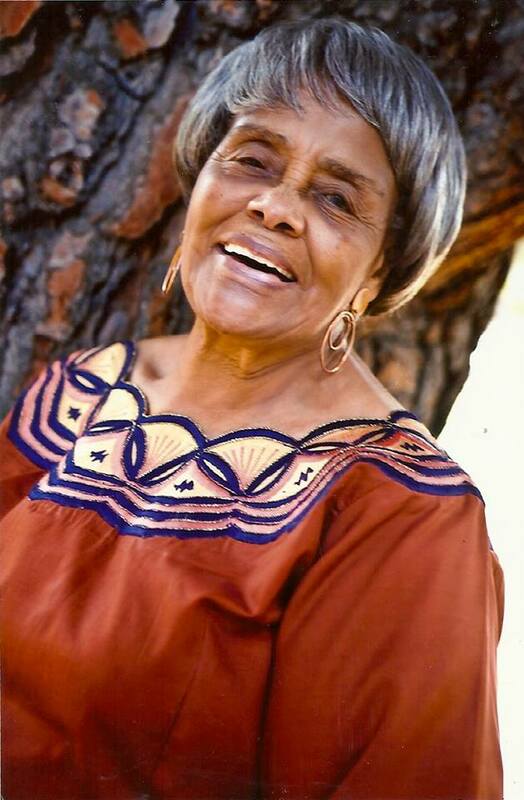 She spent the last few years of her life in California, where three of her four children now live. I am so glad she was surrounded by their love right up to the end. Today I was up early again (yay me) and packing a couple of boxes. I have a chance to send some things to Lina via a friend, but they had to go in the mail today. I really hope they make it on time. By 11:00 it was time for the seminar to start, but no one was here! Earlier this summer, some moms in one of my homeschool groups were discussing on Facebook how burned out they were, and I offered to host a video workshop by means of encouragement. The workshop is the “All Day Charlotte Mason Seminar,” presented by my friend Sonya Shafer of Simply Charlotte Mason. (Check out their website–so helpful!) Although I am not a dyed-in-the-wool Charlotte Mason devotee, I have always found this seminar so encouraging–a figurative shot in the arm. I really should watch it every summer! Anyway, eventually four ladies came and we watched through the seminar (one lady had to leave early). We had some good discussions and I do believe we all felt encouraged by the end. I was by far the most experienced homeschooler of the bunch, so it did my heart good to see younger moms taking heart and gaining confidence. I may offer another showing of this seminar in August for those who weren’t able to make it today. Once the seminar ended, I still had a bunch of critiquing to do for my critique group meeting tomorrow, not to mention preparing for my Story Quest class. Somehow my week “off” seems to be pretty busy! And I have been obsessively checking my email every few minutes since this afternoon in hopes of hearing from Mercy. I will be anxious until I know that she arrived safely in Yanji after her very long train ride. I actually remember the first time I really understood that all dads were not like my dad. I had a friend in my college years who would tell me about her dad, and the more she told me the more incredulous I became. I never met her dad, and it’s probably a good thing, because from her description he seemed very inadequate to me, and I would have hated to hurt anyone’s feeling by betraying my opinion inadvertently. Her dad, you see, was a scholar. That’s it. He didn’t fix things. He didn’t know a thing about cars. He couldn’t build anything or make anything or grow anything. He was all about the brain, and nothing else. My dad, on the other hand, was and is a scholar also. He is an ordained minister, has a master’s degree in education and has held a succession of scholarly jobs. In my growing-up years, he also maintained a large vegetable garden, fixed anything that was wrong with the car or house, landscaped a succession of yards, hunted in the African bush to provide meat for our family, trained our dogs, played the piano, built things, and even butchered pigs and chickens. I thought this was normal. I thought that doing all these things was what it meant to be a man. It shouldn’t come as much of a surprise, then, that when I found myself attracted to someone, it was a practical man. My Esteemed Spouse has always been our primary mechanic, builder, plumber, gardener, landscape architect, and remodeler. When I met him, his practical side was the more visible one, but as I got to know him I realized that he, like my dad, is also a deep thinker. He went on to get a master’s degree in business administration, and is planning to take a beginning Chinese class just for fun this fall. The great thing about being a “visionary” or idea person married to a practical man is that he can literally make my dreams come true. I can’t tell you how many times I have dreamed something up, something that would make my life easier in some way, and all I have to do is sketch it out and voilà! He can make it. More often than not, he can also suggest improvements to my original design. I can’t imagine being married to someone who can’t fix the sink, the car, the lights, the floor, or anything else. My dad set the bar pretty high, and now my husband is doing the same for the next generation.